Apollo is obviously the best thing to grace the universe since before sliced bread - or even before bread. The problem is, Zeus is angry with him, and that's never a good thing. As punishment, Apollo is forced to live indefinitely as the lowest of the low - an American teenager. He has skin problems, scrawny muscles, and his selfish ego keeps him from playing well with others, even demigods at Camp Half-Blood. Worst of all, none of his former powers work anymore. He's got plenty of enemies, and narcissism to spare. This series takes place after Percy Jackson and the Olympians and the Heroes of Olympus series. There are overlapping characters and references to events from previous books in those series, but readers could still start with this book and it would make sense. 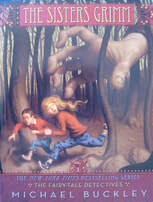 The second book in this series is The Dark Prophecy, and the third is The Burning Maze. It is quite delightful to see arrogant Apollo suffering repeated humiliations, and still, he tries to walk around with his former swagger. The plot isn't terribly memorable - lots of adventures and visits from characters from the two prior series: Percy Jackson and the Olympians and The Heroes of Olympus - but the humor is back, and that's 376 pages of an enjoyable, funny ride. In this second installment of the series, Apollo works with Leo, Calypso, Meg, and other friends and enemies from previous books to retrieve the Throne of Memory. "One of the natural consequences of being so awesome is that I attracted envy from all quarters."